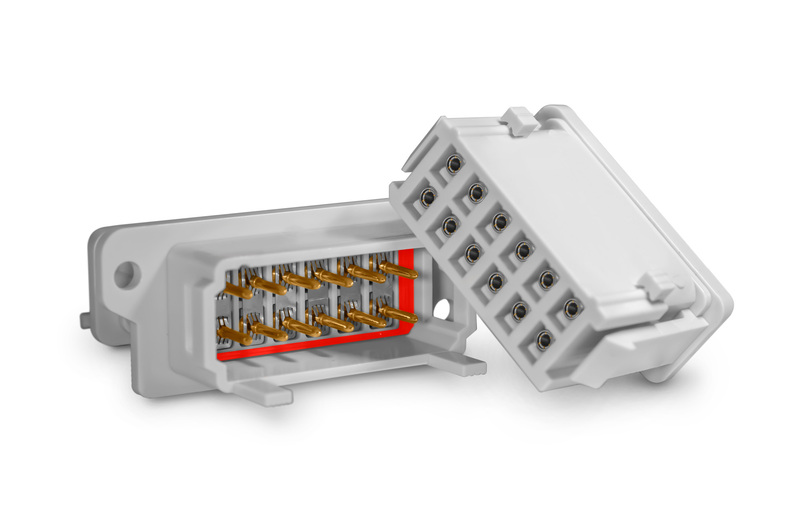 Hypertac technology provides the robust performance for the REP connector series designed to withstand the rigours of railway applications. Smiths Interconnect’ REP Series is a range of high reliability, multi-pole, sealed rectangular plastic connectors which comply with the most stringent rail standards. Available now from Aerco, the distributor and stockist of electrical and electronic components servicing hi-rel markets, the REP Series is protected to IP66 and IP67. These interconnects  deliver high performance and capacity, plus the shock, vibration and smoke and fire protection demanded by the modern rail industry,  Applications include sensors, brakes, signalling, alarms, doors, lighting, air conditioning, seats, passenger information and cabin equipment. The use of Smiths Interconnect’s well-proven Hypertac hyperboloid contact technology ensures low insertion and extraction forces, immunity to fretting corrosion, a long life cycle in harsh environments and superior performance, combined with 30% higher current carrying capacity than standard contacts of the same size. Manufactured using high quality materials, the REP Series conforms to the fire and smoke requirements of NFF 16-101, NFF 16-102, EN 45545-2 and UL94V0 standards. Shock resistant levels are to EN 61-373. The high protection levels are provided by the use of over-moulded silicone grommet and interfacial seals. REP connectors are rated to 18A and are supplied as crimp terminated contacts for cable harness applications and straight or bent terminated contacts for PCB mount. They are available in 2, 6 and 12-way formats and provide up to 500 mating cycles. Three coding devices are available: cable-to-cable, clip locking and front and back panel mount while pre-wired versions can also be supplied to customers’ specifications. No special tools are required for assembly and connection is fast, simple and secure with push to mate and press and release to un-mate. Because a single sized contact caters for cables from 0.50mm² to 2.5mm² (24-12AWG), the series offers a significant cost of ownership savings in terms of reduction in inventory holding and maintenance costs.